"I have wanted a Flat Fender Willys ever since I can remember. I've had several CJs over the years but no Flat Fender. Finally about five years ago I started collecting Willys parts. I kept piling them up in the backyard. Then last year I picked over the best of what I had and put it all together, kind of like that old Johnny Cash song "One Piece at a Time". I call it a 1946 CJ2A but it isn't an authentic antique. 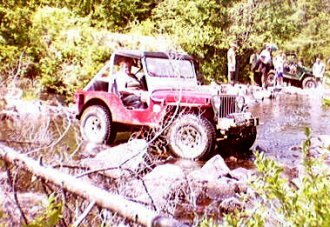 I had in more in mind a trail Jeep that I didn't mind using. I used a 1951 CJ3A frame. Good CJ2A frames are pretty hard to find here in Maine; most are rusted through or destroyed from years of snowplowing. 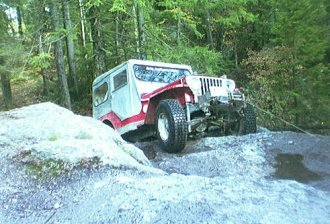 I used an early CJ2A timing chain motor and a T90 tramsmission with 3.6:1 first gear, a model 18 transfer case with the 1 1/4" pin and fine tooth input gear, a Dana 44 rearaxle (now with a Lockrite locking differential), a front axle from a CJ3A, sheetmetal from two different Cj2As, and a Cj3A windshield (again CJ2A windshields are hard to find) . Tires are some old 31x10:50 Bandag type recaps. This is the 3rd Jeep I have run these on, and they don't seem to wear out. The winch is an electric Peirce 12,500lb. Yes it is big, but it is what I had. 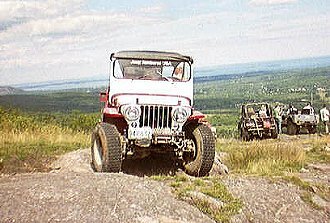 Since we got it together we have been on many that rides with the Western Maine Mountain Jeepers from the coast to far inland,and used it at the Maine Mountains Jeep Jamboree in October 2000."